The Riverview Historic District is an excellent, representative collection of houses and apartment houses constructed from 1911 to 1938. Dominated by the Bungalow/Craftsman style, other popular architectural styles in the district included the Tudor Revival, Prairie School and Colonial Revival. Although predominately a middle class neighborhood, the district also contains a number of larger, better-appointed homes built by many of the leading citizens of Tulsa. This includes the Clinton-Hardy House, the Bird House, the Kerr House and the magnificent McBirney Mansion. Riverview derived its name from the Riverview Elementary School, which was located at 512 West Twelfth at the intersection of Twelfth and Guthrie. In 1975, the school was demolished, but the area’s identification with the name of the school continues. The construction of the Clinton-Hardy House in the Riverview area was not a completely altruistic move on Clinton’s part. Clinton, along with Daniel Horsley and Norvell E. Woodson, were designated by Nola Childers Tracy in early January 1918 as agents for development of her land inherited from her father that was part of his Creek allotment. The additions formed from this land became the Childers Heights and Norvell Park additions to the city of Tulsa. As her agents, Clinton and Horsley shared in the ten percent net commission of the gross amount generated by the sale of lots in these additions. According to court records, between January 1918 and September 1918, the total gross amounted to about $100,000. Featuring an architectural style that gained popularity during the latter part of the 1920s are the six apartment buildings located off of Riverside Drive. Built in the early 1930s, these coordinating Tudor Revival style apartment buildings were originally named, in order from east to west, Hemphurst Terrace, Hemphurst Manor, Hemphurst Lodge, Hemphurst Castle, Hemphurst Arms and Hemphurst Hall. These buildings are striking examples of the Tudor Revival style as applied to multiple dwellings. The buildings are not identical but share many similar features and an overall design. Several streets in the district have had their names changed. The pre-statehood T.T.T. Addition planned for West 13th Street to be called Sycamore Street. Both the Campbell and Childers Heights additions intended for West 14th Place to be called Walnut Street. The Childers Heights and Norvell Park plats were originally divided by Norvell Road. In 1920, Norvell Road became Childers Avenue and, in 1925, Houston Avenue. Directly related to this, the original Houston Avenue, situated one street to the west between Norvell Road and Jackson Avenue, was renamed Indian Avenue in 1925. As included on the 1918 and 1920 plats, Riverside Drive was simply called Boulevard. By 1925, the existing name had been applied to the street. Riverview was listed in the National Register of Historic Places on September 6, 2007 under National Register criteria C. Its NRIS number is 07000906. 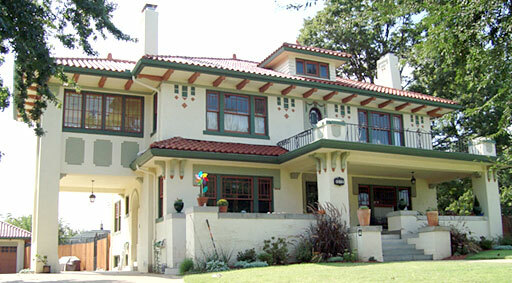 Oklahoma Landmarks Inventory: Clinton/Hardy House, James H. McBirney Mansion, Riverview. Cultural Resources in the Tulsa Urban Study Area, by Kelly C. Duncan, edited by Anneta L. Cheek, Archaeological Research Associates Research Report #14, 1977: J. H. McBirney House, p. 44; Spotlight Theatre, p. 49; Riverview Neighborhood, p. 42.